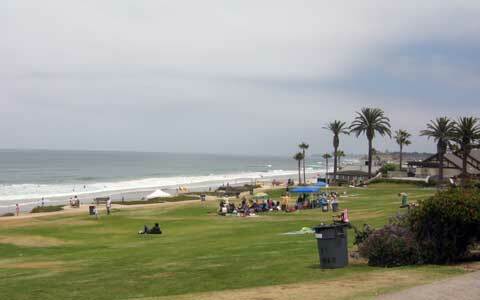 Beautiful Del Mar beach in San Diego is popular with sunbathers, surfers, volleyball players, and families. Del Mar is an upscale but quaint community or village 20 miles north of San Diego, just north of La Jolla and south of Solana Beach. It is famous for the Del Mar Fairgrounds and Racetrack, founded by Bing Crosby. The popular San Diego County Fair is held at the fairgrounds every spring. Del Mar City Beach is definitely one of the best beaches in southern California. We like to stakeout a spot in one of the nearby seaside grassy parks near 15th street, Powerhouse Park or Seagrove Park, for a picnic after a morning at the beach. You can pick up gourmet picnic items at a Del Mar grocery store a few blocks away across Camino del Mar. “You'd catch 'em surfin' at Del Mar” as the Beach Boys sang in their hit Surfin’ USA, and the surfing is definitely good in Del Mar. Like many of the San Diego beaches, there are separate areas designated for surfers and swimmers. Location: Pacific Ocean near Coast Blvd and 15th St. in Del Mar, California. Parking: You definitely want to arrive in the morning, as parking is challenging and expensive in Del Mar. If you are lucky you might find metered parking along the street for $2.00 per hour, or you can park in the lot across the street for $4.00 an hour. (Tip – at the northern end of the beach, near 29th Avenue, there is a free parking lot and free on-street parking along Camino del Mar). Getting There: Short walk to the parks and beach from parking areas. 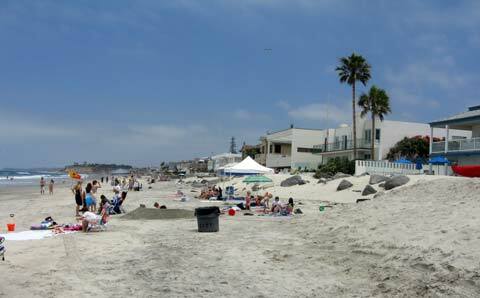 Things to Do: There are 101 things to do at the beach, and you can do most of them here at Del Mar beach San Diego. The parks at the south end provide grassy places and a playground for the younger ones. The bathrooms and outdoor showers are very nice. 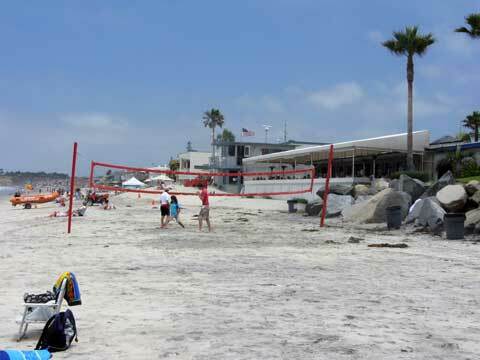 Volleyball enthusiasts can enjoy a great game of San Diego beach volleyball here too. Families love the deep sandy beaches at the south end near 15th Street, that stretch all the way north to 29th street, where the Del Mar Dog Beach begins. At low tide you can also walk south from Del Mar City Beach to Torrey Pines Beach. Things to See: Young people and families at the beach, sunset over the Pacific Ocean. Services: Within walking distance there are restaurants, bars, surf shops, rental shops and a deli on Camino del Mar. High Tide Access: Good access to the beach. Dogs: Depends on the area and season. See dog beach information below. Disability Access: Some disabled parking and access. Our best time at a San Diego beach was a trip to Del Mar. We packed up a picnic lunch, 2 cars full of kids, and a roll of quarters, and headed out early to grab a coveted parking spot. We staked out a spot on the grassy slope where we would have some afternoon shade, then spent the morning on the beach. The sandy beach was deep and the kids played in the gentle waves and body surfed. Later we enjoyed a picnic lunch in the park, played frisbee, and joined a group in a game of beach volleyball. Before we left, we showered off in the nice outdoor showers near the restrooms, and walked into downtown Del Mar and picked out some awesome desserts from the deli. I plan to return sometime without the kids, to enjoy dinner at one of the fine restaurants in Del Mar! The Del Mar beaches are beautiful, but the dog rules are a little complicated. 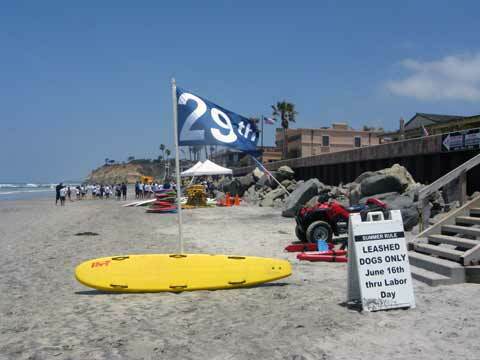 •	Leashed dogs are allowed at Del Mar City Beach (Powerhouse Park to 29th Street) from the Day after Labor Day through June 15. •	Leashed dogs are allowed year round at Del Mar South of Powerhouse Park (to 6th street). •	Unleashed dogs are allowed North of 29th street from the day after Labor Day through June 15 dogs, and allowed if leashed during the summer months. I’ve actually found two nice Del Mar beaches north of 29th street – Del Mar North Dog Beach and Del Mar Rivermouth Dog Beach. More information can be found on the San Diego dog beaches page. 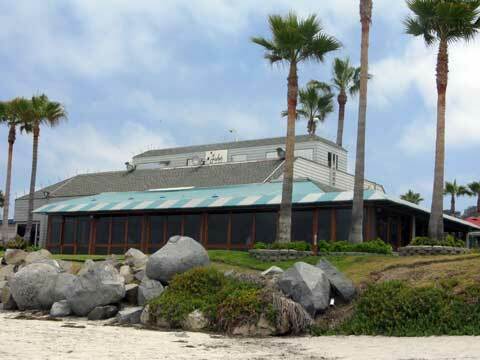 There are several famous beachfront restaurants along the Del Mar beach - Jakes and Poseidon, two of the best San Diego restaurants. 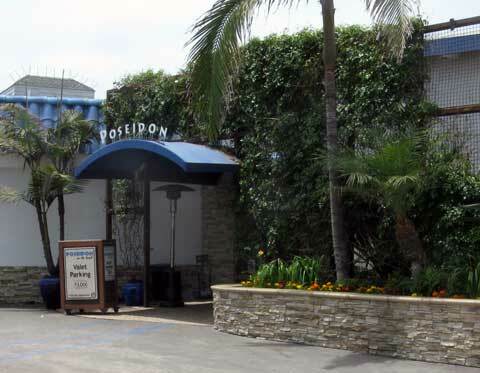 We love to dine on the patio at Poseidon, right next to the sandy beach. Jakes is a popular happening place with a nice Happy Hour menu. Both have fine dining. A short distance away near the Del Mar Fairgrounds and Racetrack is the Del Mar Fish Market, a fresh fish and seafood restaurant with friendly service (ask for Tara H.) and reasonable prices. If you are looking for the best Mexican food in San Diego, try Tony’s, an authentic family-run Mexican restaurant, or Fidel’s, one of our favorite Mexican restaurants that is popular with tourists and locals. 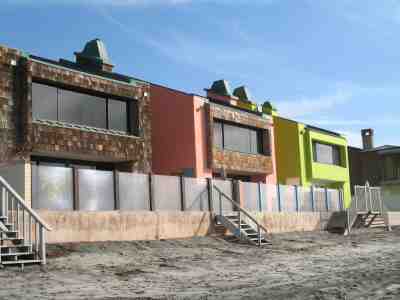 There are a number of Del Mar vacation rentals along the beach. Some are right on the sandy beach, while others will be a short walk to the beach. There is easy beach access all along the Del Mar beach. Click on the link below to see some Del Mar vacation rentals. 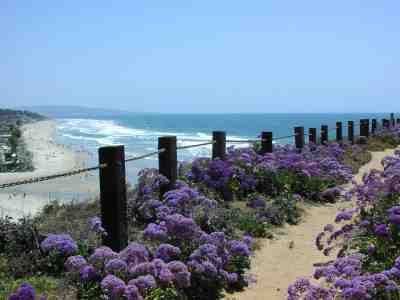 Looking for upscale beach rentals in Del Mar? Exquisite Del Mar lodging can be found at the L’Auberge Del Mar. Beach front dining, luxury rooms, spa treatments right on the beach in the village of Del Mar. The Del Mar Motel on the Beach is next to the Poseidon restaurant right on the Del Mar beach. If you are looking for beach rentals right on the sandy beach, the Del Mar Motel on the Beach is a nice find. At 15th Avenue, turn west toward the beach and go two blocks and turn right. There is metered parking for $2.00 an hour (bring lots of quarters) or a parking lot for $4.00 an hour. At Camino Del Mar and 29th Avenue there is a small free parking lot on the west side of Camino Del Mar. There is also free street parking in this residential area. Through the parking lot is the beach access. The signs clearly mark 29th street, so if you have a dog with you, go north, if not, go south. There is plenty of beach to enjoy.